It is both trite and true to remark how quickly 2015 passed. This was never more real than if you worked in social media. 2015 brought many shifts to the social media landscape, some noteworthy, and some less worthy. You may have missed a few things. For this reason, we’ve summed up the more Earth-shattering social media news so you could look back and consider each with wandering nostalgia. Facebook at Work was introduced. Finally, because we were all pining for more access to Facebook. This new option from camp Zuckerberg created a platform within a platform. It was designed to allow users to create a work profile in addition to their regular profile in order to be on Facebook all the time. Yay. The jury is still out on whether or not this was a worthwhile investment for FB or the companies who opted in. The litmus for this is to ask how many of your friends are on there? I can’t name one. Most of my network uses Facebook like normal people, sheepishly accessing it from their desktop or smartphone. Facebook launched a mobile app for managing ads. Seriously, if you are not using this app you’re missing out, especially if you manage multiple pages. I would lobby that managing notifications on my iPhone are superior to Business Manager on my desktop. The navigation between each page is intuitive. The notifications are visible at a glance. You can see which of your pages need attention, click the notifications, and reply with lightening speed. As many page managers have noticed, Facebook is now scoring your speed in replying to notifications. With this app you can easily stay under five minutes. An otherwise quiet move by Google did not fly below the radar for the social media community when they separated photos from Google+. Naysayers of the platform saw it as further evidence that the platform was dying, like they were parting out the best pieces of an automobile with a blown engine. This was the second tool dropped since Hangouts was removed. For the fans, they characterized the move as a streamlining of services in preparation for something big. Now that we’ve all seen the overhaul made to the platform, we know the naysayers were wrong… or were they? At first, it seemed Periscope and Meerkat would be tied together in an endless free will into the social media abyss. Then Twitter threw down the gauntlet, writing the future by acquiring Periscope. In subsequent months, it was no surprise to see which platform rose above the other in popularity. By midyear Periscope edged out it’s worthy competitor. It may be all for naught. Facebook has just launched their version of streaming video and may just bury both of them. Further confusing the debate about whether or not Google+ was dying, in an equally quiet move to dropping photos, Google bolted Collections onto their social platform. For most users it looked like a ploy to pick up Pinterest users, sadly too late in the game. For fans of the platform it was the proof they needed that Google intends to build something new with Google+. Even with the recent UI changes we have yet to see the full ramifications of Collections, but in true Google fashion, they’re pushing forward with the value add. They’ve buried the importance of circle-management in light of collections. Time will tell. Because what would a social feed be without videos that play without you having to press buttons? Twitter introduced autoplay videos to their platform. The videos play as you scan down your feed, but do not make a sound until you ask Twitter to play the audio. It’s a subtle and interesting feature, probably more reflecting of the standard of speedy internets versus users needing to live in a world of moving pictures. On a case-by-case basis, Pinterest unveiled buyable pins. Past the early adopters, the year has shown little progress in overall adaptation, but in even more recent news Pinterest acquired The Hunt, a product finding service. The Hunt team brings mobile shopping expertise to Pinterest, and may be part of the plan to close the gap between Pinterest and your ecommerce site’s inventory management systems. 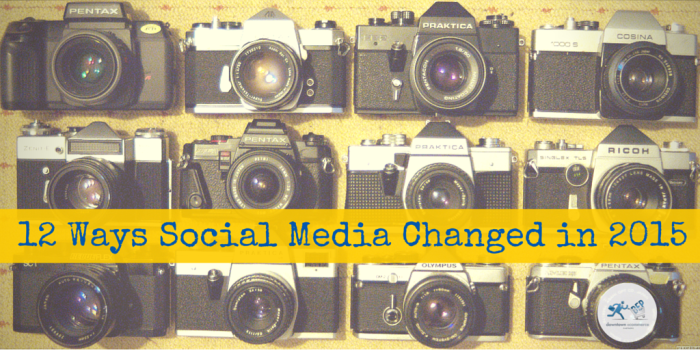 August brought two equally mediocre changes to the social media landscape. Facebook changed their news feed controls (for like the third time in twelve months) and Twitter rolled out Persona targeting. The feed changes to Facebook were designed to allow users to better customize their view, and the changes to Twitter’s marketing abilities really only appealed to us marketers. They still aren’t going tell you the actual personas you have trolling your Twitter page. That would be giving away the store. Facebook Live Streaming launched, completely dismantling the Meerkat and Periscope platforms. Just kidding. Most regular Facebook users did not even notice the change. The test for streaming video will be what happens in 2016. In all likelihood this medium has not really taken off yet. As media outlets and video geeks start to mainline content to our feeds, we will probably figure out that we can no longer live our lives without seeing everything the moment it happens. It will be that moment that the four horsemen will ride out. Ads are lame when you want to watch a video. At least that’s the sentiment YouTube was banking on, when they rolled out YouTube Red. For $9.99 a month you can enjoy your YouTube experience ad-free, and in time see dedicated content. The platform promises to be better than Netflix, Amazon, and Hulu combined. As of this writing, however, they have an uphill battle ahead of them. Then it happened. No, not hearts replacing stars on Twitter. That was not really news. Google (or Alphabet?) finally overhauled their Google+ platform. Suddenly all of the arguments about whether or not they were parting out the best of their social network hushed, as users observed a hot new UI. Of course, most of us are still trying to find our precious circles and where Hangouts went. Time will tell, but clearly Alphabet is not taking Google+ out to pasture yet. Our best guess? The same users will still appreciate Google+ for what it is. I know I promised you twelve, but this is long enough. Besides, December hasn’t actually ended yet. This is a tough time of year to roll out anything other than Christmas toys and ad campaigns. We expect that the new year will bring the usual slew of news after the holidays calm down. Until then, we can all stream videos of holiday work parties on our favorite channel, enjoy ad-free tube, and start massive photo collections to share with all the world. Or we can not do those things. Whatever.